Finding Audrey tells the story of 14-year-old Audrey who suffers from social anxiety and depression after a traumatic incident with her fellow school peers left her paralysed with fear in social situations and unable to look anyone in the eye. She wears dark glasses inside her house and the very idea of talking to someone outside her family gives her panic attacks. Enter Linus, her older brother Frank’s quirky and understanding friend. Slowly, Audrey begins to open herself up to Linus and the social situations that surround her. But is she setting herself on a downward spiral? And is her mother’s obsession with her brother’s addiction to gaming ruining their family… Only time will tell. As a big fan is Sophie Kinsella’s Confessions of a Shopaholic series, I was incredibly excited to hear she was taking her witty writing and undeniable humour to YA books. And this novel did not disappoint. Kinsella successfully tackles the serious issues of teen bullying and social anxiety/depression while putting a light-hearted spin on the storyline which enlightens and doesn’t diminish the overall effect of the storyline. Audrey’s mother was HILARIOUS from her obsession with silly Daily Mail articles to her hilarious antics as she tries to catch Frank in the act of video gaming (fear that he has a serious video game addiction after reading an article about it), I was laughing out loud on the plane as I read this novel. Although I did love these bits of the novel, I will say it trivialises addiction a tiny bit. It’s quite clear that Frank probably DOES have a video gaming addiction, and to just brush it aside after all the fuss throughout the novel felt a bit pointless. I also had a problem with Linus’ character. As much as I liked him and the idea of him, I thought he was very one dimensional. Kinsella includes some very interesting aspects of his life i.e. His grandmother who has dementia and thinks she is perpetually 25 living with his family, but I just don’t think his character was explored as well as it could have been, although perhaps this was a ploy to focus the attention on Audrey and merely see Linus as the instigator of her road to recovery. I would have liked a bit more depth into Linus though. The same thing can be said for Frank; while witty and hilarious in his bickering with their mother, I felt there could have been more to the video game addiction storyline, even if it was tactic to play off some of the heavier parts. I will say that I was extremely annoyed that we never actually found out what triggered Audrey’s social anxiety. It is alluded to on multiple occasions and I’m assuming it had something to do with her high school peers having bullied her, but no one ever comes out and says what happened. As a reader, I found this very frustrating and made it difficult to understand the reasoning behind Audrey’s bouts of insecurity and anxiousness. As someone who struggles with anxiety, I could very much relate to quite a lot of the issues and themes throughout the novel, but I felt this exclusion contributed towards an overall lack of depth. I did very much enjoy this novel, and I do recommend it to other people for its witty humour and lighter take on a serious issue that plagues thousands of people daily. I don’t think I will be reading it again as I was disappointed with its lack of depth in some areas and I felt that these could have been fleshed out if the novel was longer. 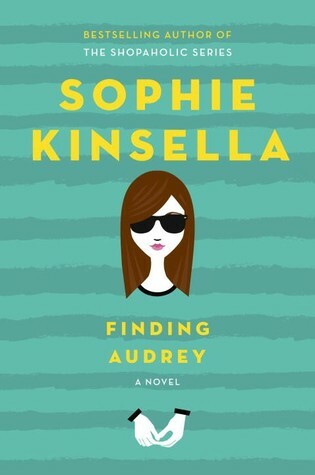 Perhaps it’s simply that Kinsella is much more inclined to write lighthearted adult novels and as such, I don’t think Finding Audrey did the themes/storyline justice as a YA novel.